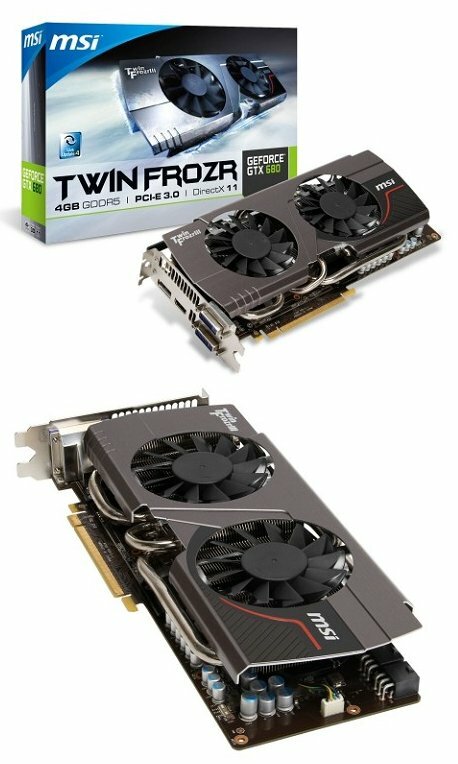 Legit Reviews delivers word that MSI has introduced two new GeForce GTX 680 graphics cards with Twin Frozr III cooler and 4GB GDDR5 memory. Compared to the stock cooler, the Twin Frozr III cooler is claimed to allow 20% more airflow with its propeller blade technology than traditional fan designs. The two fans have dual 8 PWM fans with SuperPipe technology to provide better heat dissipation and deliver 22 degrees centigrade cooler temperatures along with a 10.2 dB reduction in noise. The cards also come with all solid capacitors, rated for a 10 year lifetime at full load. Connectivity consists of a Dual-link DVI-I port, Dual-link DVI-D port, DisplayPort connector and a HDMI port. The N680GTX Twin Frozr 4GD5 is clocked at reference speeds of 1006MHz (1058MHz boost clock) and 6008MHz (effective) for the memory, while the N680GTX Twin Frozr 4GD5/OC is overclocked to 1058MHz with a boost clock of 1124MHz. The memory is clocked at the same 6008MHz. Prices have not yet been disclosed, but are likely to cost 15-25% more than the 2GB versions.